The 9th Annual Chester County Balloon Festival will be held June 19th, 20th, 21st 2015 at the New Garden Flying Field. It is a must attend event providing family fun for all ages. 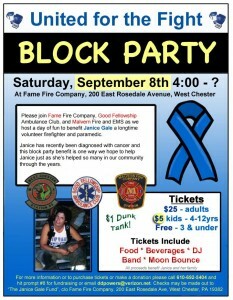 Proceeds will go to the Chester County Hero Fund and other local community groups. Please visit http://ccballoonfest.com/ for details, tickets, and information. The 3rd Annual Benefit Ride will be held on Sunday June 2. Benny’s Pizza in West Chester. in coordination with West Chester Super Sunday. link. If you have a motorcycle, we hope to see you there. West Chester Fire Department announces the passing of Captain Chris Good. Please see the “Capt. Chris Good” Page for more detail. 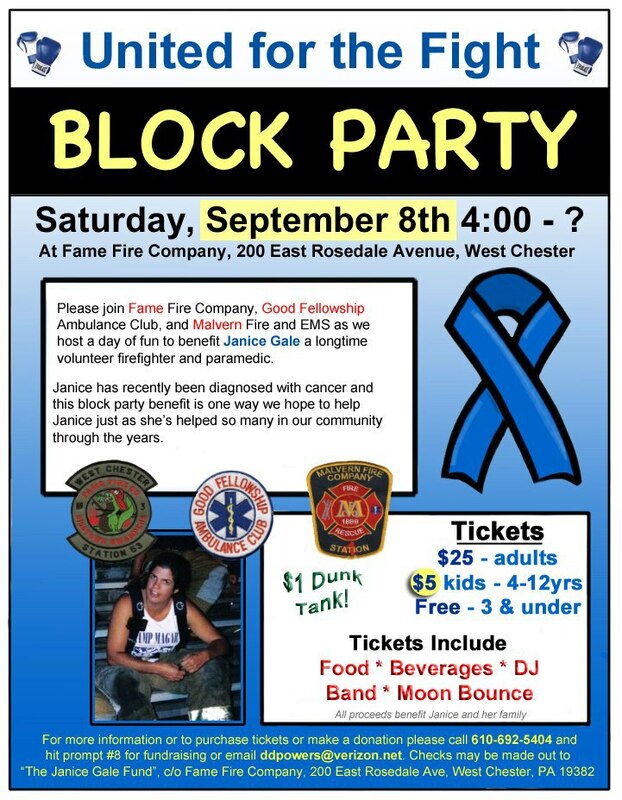 Fame Fire Co., Good Fellowship Amb., and Malvern Fire Co. are hosting a block party-themed fundraising event in support of volunteer firefighter, EMT and mother, Janice Gale, who was recently diagnosed with cancer. Please see the attached info and help support a local FF/EMT-Paramedic. from 10:00 am to 2:00 pm. See the attached Info and Registration form. Cars will be displayed between 179 and 199 Lancaster Avenue, Malvern, PA 19355. Ads and Sponsorships still available. This entry was posted in Uncategorized on August 24, 2012 by admin. The 2nd Annual Benefit Ride will be held on Sunday June 3. 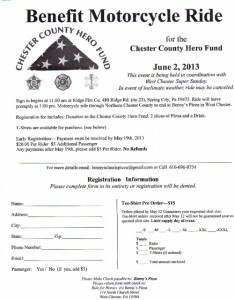 Proceeds to benefit the Chester County Hero Fund. This year’s motorcycle ride will tour beautiful southern Chester County and is sponsored and organized by Benny’s Pizza in West Chester. Registration and sign-in is between 9:00 am and 11:00 am at the Government Services Building located at 601 Westtown Road, West Chester. The event will end in West Chester and is being held in coordination with West Chester Super Sunday. For more information and early registration click on the below link. If you have a motorcycle, we hope to see you there. Richard (Sal) Salcido M.D. Prof. of Physical Medicine and Rehabilitation, University of Pennsylvania has partnered with the Chester County Hero Fund in support of Jay Raffetto, a Navy Corpsman who was seriously injured in an IED explosion in Afghanistan. On October 30th Dr. Salcido will run the Marine Corps Marathon to support Jay Raffetto’s rehabilitation efforts. Read more under the Corpsman Jay Raffetto Page. This entry was posted in Uncategorized on September 22, 2011 by admin. Chester County FOP – The Chester County Fraternal Order of Police, Lodge #11 announces its Seventh Annual “Hero’s Golf Tournament” on Monday, October 3, 2011 at the Downingtown Country Club. This Tournament is a major source of funds for the Hero Fund on an annual basis. Please click on the below link for registration and sponsorship information. Whitford County Club – The members of the Whitford Country Club announces “The Whitford Charitable Fund Golf Classic” on August 27 and 28 for the benefit of seven Chester County charitable organizations. 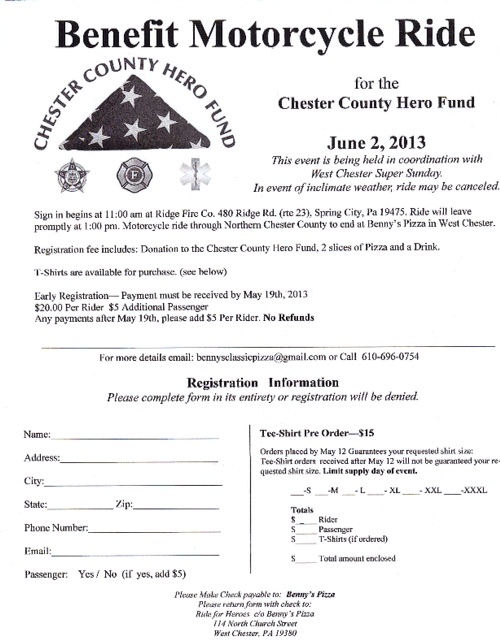 The Chester County Hero Fund is one of those organizations. Please click on the below link for registration and sponsorship information. This entry was posted in Uncategorized on July 21, 2011 by admin.